The RRA has proven to be tough and be resilient both on and off the track since the beginning...this 1st eliminations event of 2017 would prove no different. Extreme conditions seem to be the norm for us, and we do what we can to roll with it. During the heat of the day track temps were teetering on record highs making the surface a challenge to contend with, not to mention the racers with weather stations were registering us just shy of 4500 ft!! It may have been miserable and hot but we were racing and that my friends makes for a great day...especially considering less than 24 hrs later the track was being pummeled with rain!! As always Jim Curtis and his crew did an awesome job!!! This event marked the return of Outlaw Limited Street to the RRA, bringing them back under such harsh weather conditions wasn't really how we all envisioned it but these guys did a hell of a job. They came out, played it smart and reigned the cars in to accommodate the extremes we were dealt. When the sun went down and the track temps cooled the cars ET's definitely began to improve. 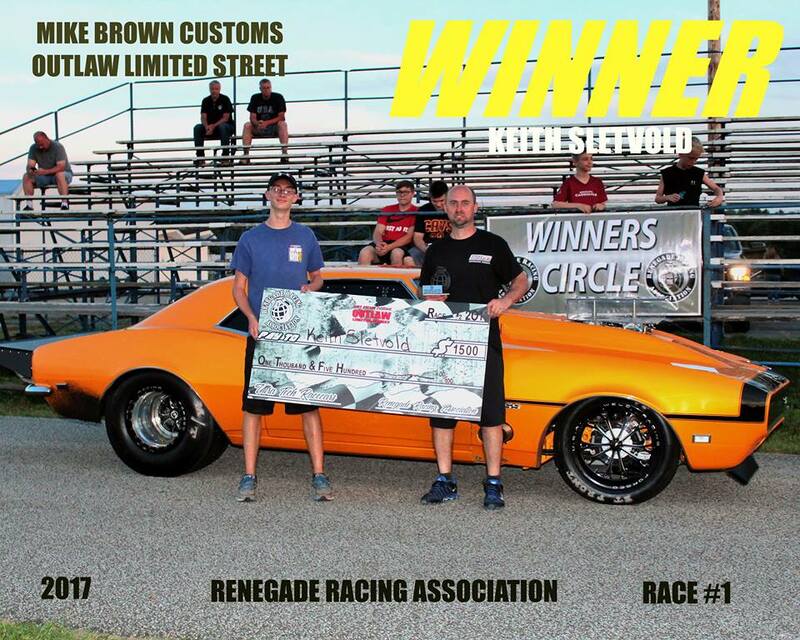 Couple of guys running very low 5 second passes and our event winner, Keith Sletvold, putting up back to back passes in the 4.70's to wrap up the night!! We had 8 racers registered into the event which is not bad considering...as far as the RRA goes the field was a blend of Veterans glad to be back and Rookies to the series joining in on the action. 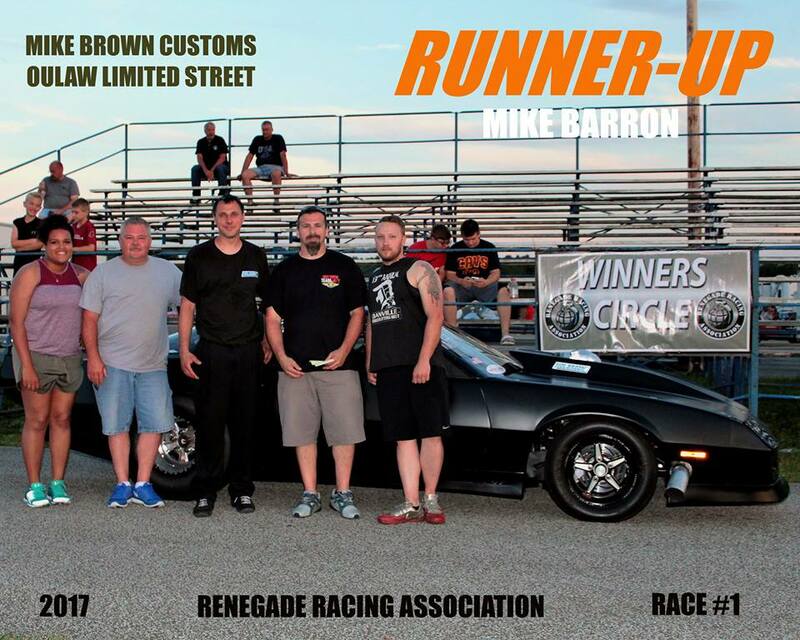 Mike Barran has always supported the series both on and off the track, this past March his Camaro was part of our display at the Piston Powered Auto-rama. Ray Litz has been a part of the RRA since season one, running 8.90 back then. He is the one who launched the website for us and still supports keeping it online it to this day. Barry Boone is another 8.90 alumni moving up the ranks over the years making his OLS debut within the RRA this past weekend. Randy Jewell is a true rookie to the series, this event marked his 1st time ever running with the series on any level, hopefully we see a lot more of him in the future. 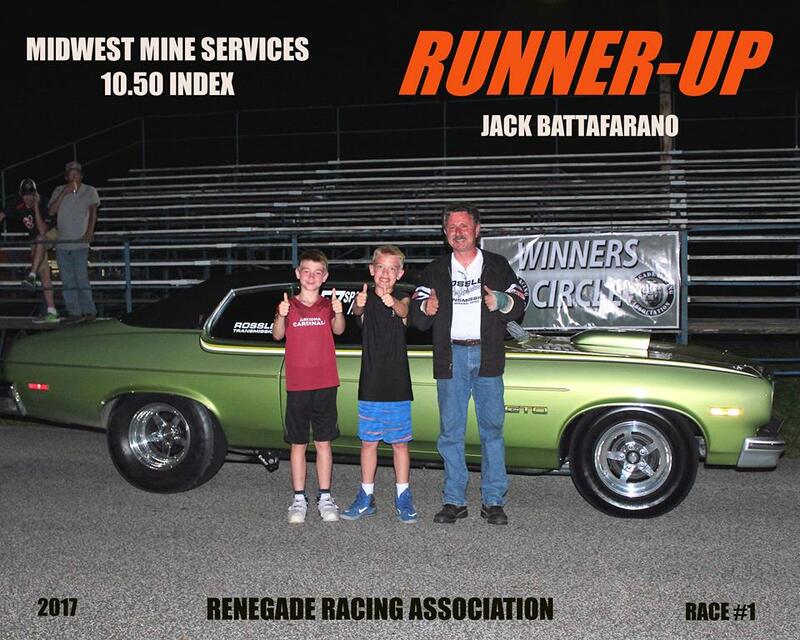 Al DiSalvo, Ed McGuinn and their crew have been running with the RRA since 2013, this time around Moe Alfaqih made the trip down to run his 1st Renegade event (outside of WBTS). Bill Trovato also joined the guys wheeling Al DiSalvo's Chevelle. This past weekend we all raced together BUT if it all works out come July 22nd we will be on opposing teams at the BSO vs The World event in Lancaster...I cannot wait to see how that all plays out!! I want to say thank you to these guys for coming out and supporting the return of the class along with Mike Brown who extended his support over from TKO to become the class' title sponsor for this event as well. Also to Chad Pokopatz who contributed to bringing back the class. 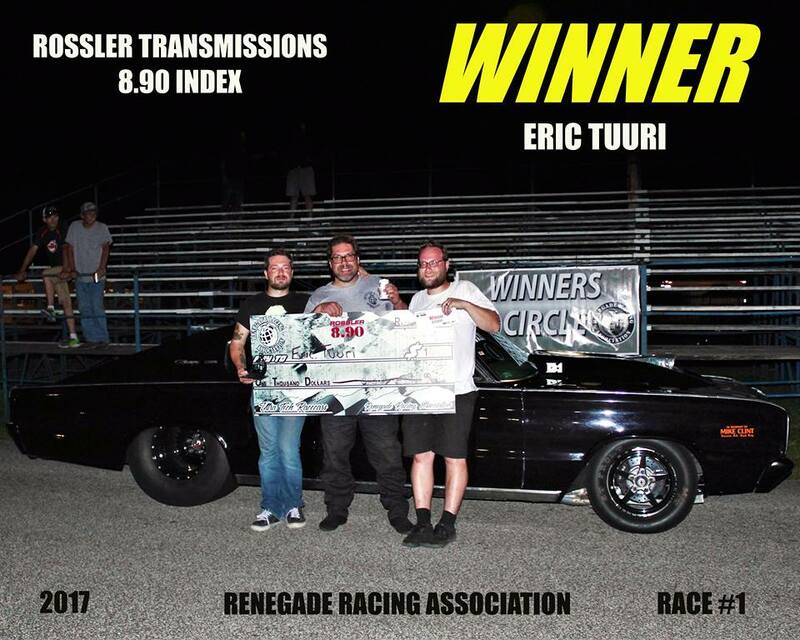 They will all be running for $6,000 to Win at the Summit Racing Equipment Thunder Capital "TKO" on August 5th with the additional $1000 Winner take All Bonus as a thank you for participating this weekend. 1st event of the year was a titled event...The Spring Showcase. 2nd event of the year was just plain old Race #2 but from the moment we hit the track it seemed the event was a coming out party of sorts for Our Defending Champions. 3 of the 4 Index Class Champions secured the #1 qualifying spot within their classes and by the end of the night 3 of the 4 had won their respective classes. The majority of the 8.90 Class seemed to be plagued with mechanical gremlins that were further complicated by the extreme heat of the day but it is early in the season and we have yet to see the best of what this class has to offer!!! Sadly Troy Wotring's engine came apart at the top end during the 1st qualifier but thankfully Troy is a very safety conscious racer and didn't need the RRA to begin enforcing diaper rules to have one in place. He had been to J&J Performance long before they became a supporter of the series. He was prepared, having one of many pieces of safety equipment no one ever wants to use in place. Even with the diaper small amount of oil did find its way onto the track and also onto Troy's brakes, making it a challenge to get the GTO stopped and pulled off to the side. Just imagine the story I would be telling you had he not had that diaper in place when the motor let loose...definitely something to think about!!! Two former 8.90 Champions, Eric Tuuri (2016) and Bill Benson (2015) stole the show...Qualifying #1 and #2 and finishing the event in the same order. Meeting in the finals with the win going to the 2016 Defending Champion...Eric Tuuri. CONGRATS TO ERIC TUURI & CREW!!! This class is known for some intense competition but by the looks of this ladder they need to dust the cobwebs off their transbrake buttons!! Brad Courson was the only Non-Champion to claim the #1 Qualifying spot within the series...Heat be damned he had that thing set on kill from the word Go!! 1st rd he ran a 9.91 and 2nd rd he bestest himself and kept Dennis Chillik at bay with a 9.906 to keep possession of the top spot on the ladder. 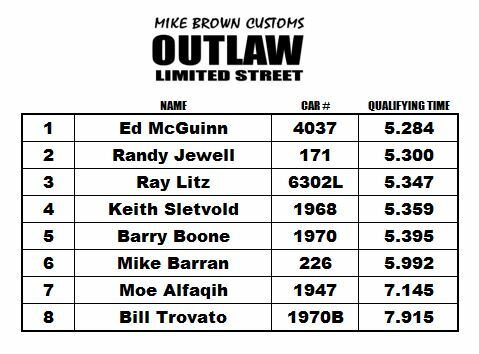 We had 17 cars so ran out one pair before we got into full blown eliminations and as you see from the ladder Jim Mikesina may have been the 1st to fall but he was in very good company when it came to difficulty timing the tree! 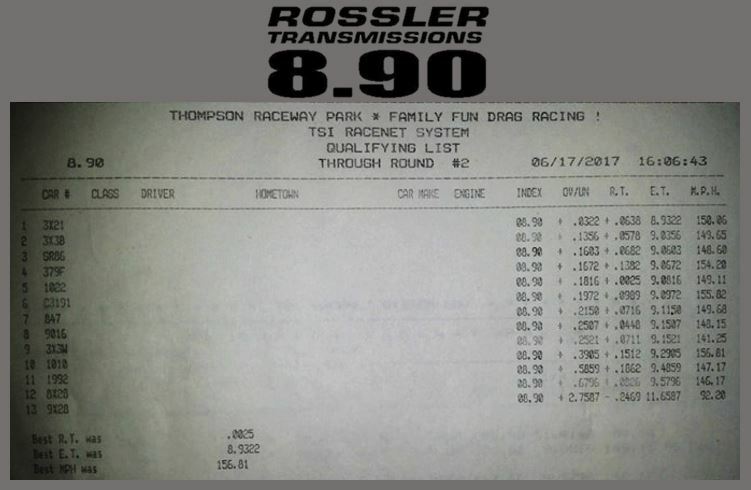 Tom Rossi is a Rookie to the RRA came out in the 1st rd of eliminations to snag 8 bonus points for running Dead On with a Zero!! 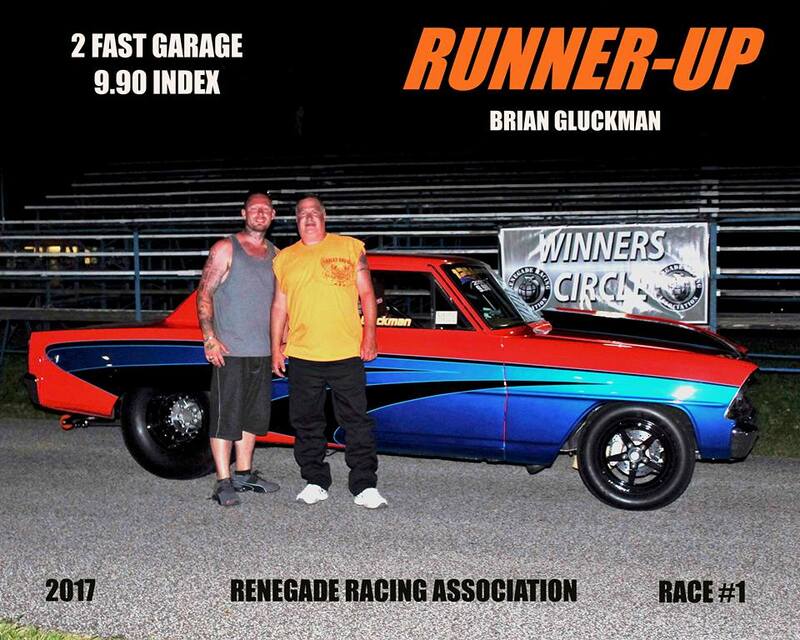 Brian Gluckman's 9.90 debut found him in the finals facing the 2 time defending Champion Brian Kennelley. Gluckman may have been a little too excited to get the race underway as he left way early handing Kennelley his 1st win of the new season. 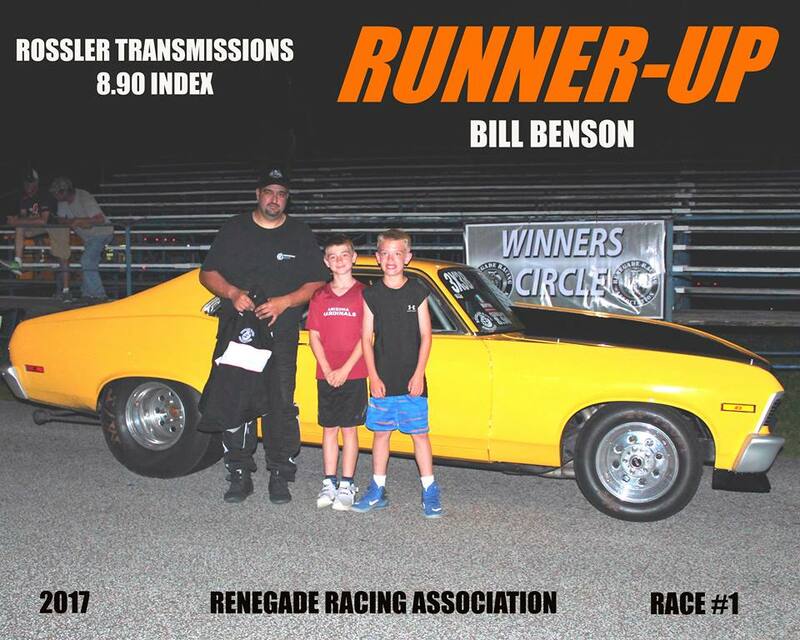 The "Naughty Nova II" Crew/Family are just awesome as you can see from the photo below and the RRA has a history of sentimental trips to the Winner's Circle, June 17th would prove no different. Last fall Brian Kennelley decided to let go of the car that won him back to back titles to chase a dream he had wanted to come true for many years. He knew where the original Naughty Nova driven by his Dad had been all these years and the time finally came...the owner was ready to move on and gave Brian a call, they brought the ole girl home and got to work!! 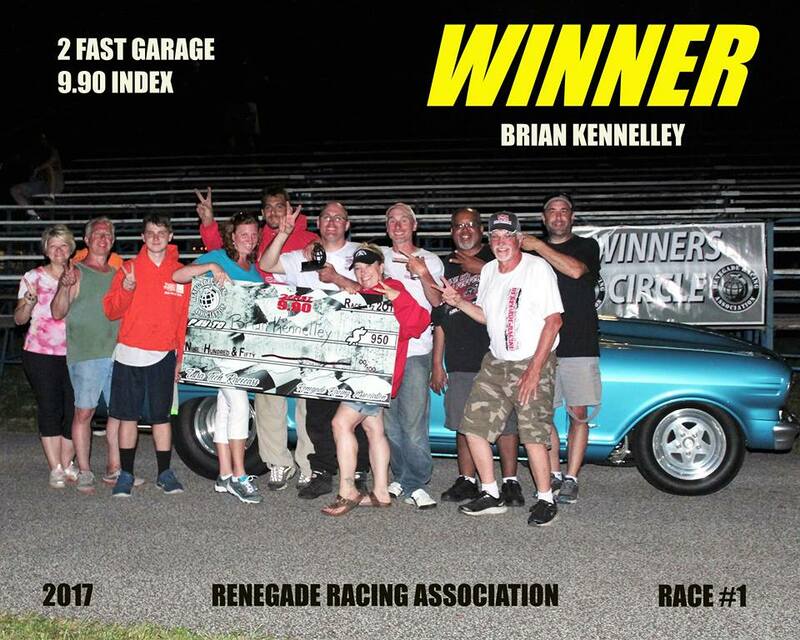 It was a long winter spent in the garage and a spring filled with kinks that needed to be worked out but she was once again a part of the Kennelley family and together they found the Winner's Circle at his 1st title defense event of 2017!! 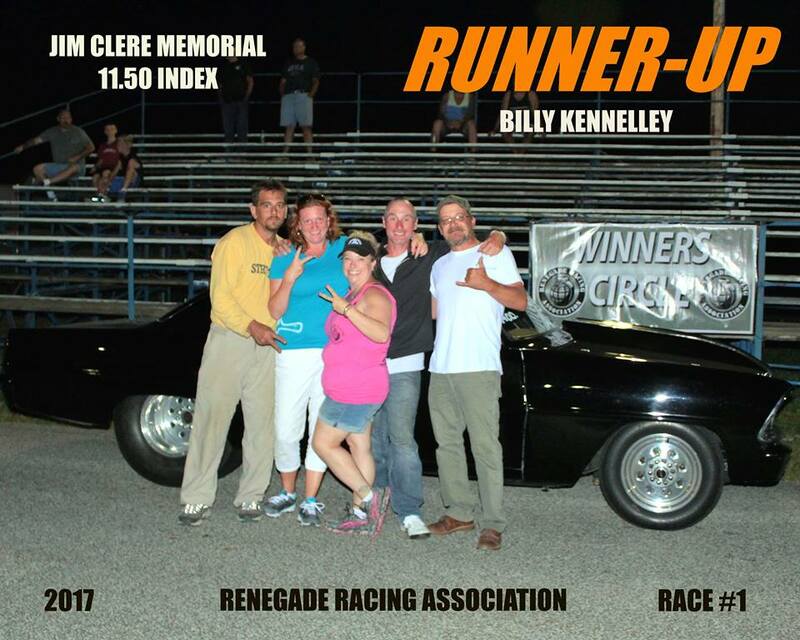 Congrats to Brian Kennelley and Crew!!! Keeping with tradition our 10.50 Class boasted the highest car counts for the day with 21 total entries into eliminations, also keeping with tradition we got all of our bye runs out of the way in the 1st round. 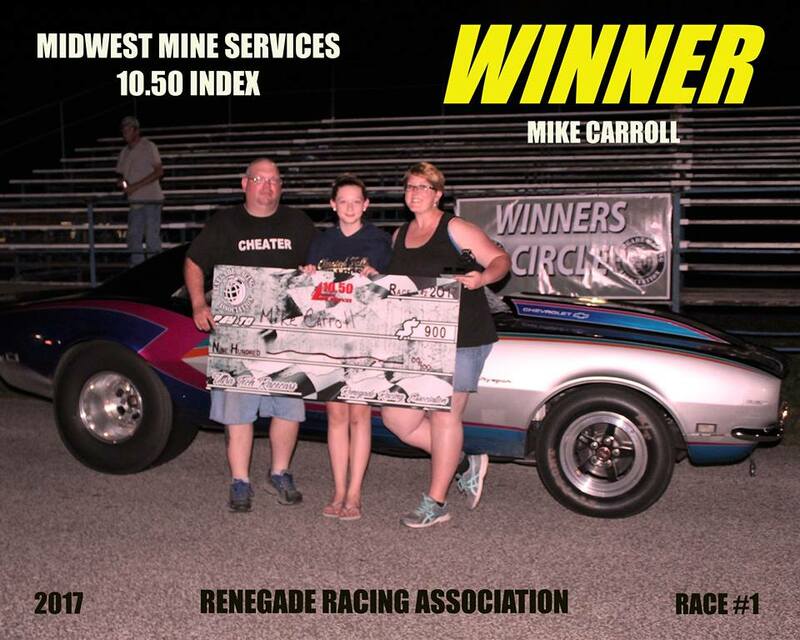 Defending Champion Mike Carroll was able to narrowly snag the #1 Qualifying spot over Terry Buza to earn the Midwest Mine Services bonus and title of the "10.50 Godfather" for race #2 claiming the $150 prize!! 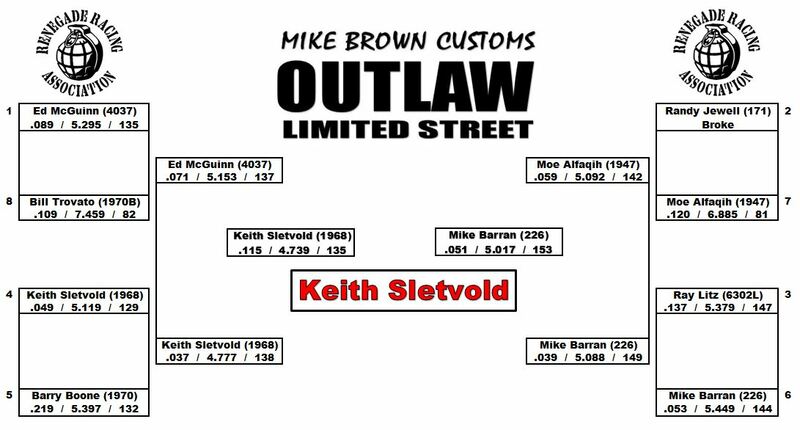 The folks at Midwest Mine Services also put a $100 Bounty on Mike's head in eliminations, the ladder was set with 4 potential "hitmen" having a shot at him. When they proved unsuccessful and Carroll would take home the money on the unclaimed hit. Jack Battafarano had been chopping the tree down all day long making his way to the final to face Mike Carroll, unfortunately he would go .004 red allowing Mike Carroll to slip past him into the Winner's Circle. Carroll holds the record in the RRA for most titles (3) BUT he has never successfully defended a title or for those of you who are more superstitious he has never won in a year ending in an odd number. Will this year be different or will the pattern of the past 5 yrs continue?? If it is up to Carroll we know the answer to that but he does have some steep competition among the other 29 10.50 points contenders so will just have to wait and see what the rest of the season brings!! With 16 cars in competition there are no bye runs, no floating by to 2nd round if you want to get there you have to earn it the hard way! In 11.50 we have another Defending Champion and another #1 Qualifier...not only did Tim McKenzie take the top spot, he also annihilated the tree 1st round of eliminations to take home 8 bonus points!! Jacob Matis may have lost the 1st round by way of red light but what he did on the top end goes to show you that you should NEVER toss in the towel and coast down the track. Championships are won and lost by far less than 8 points and he was able to salvage 8 bonus points on that losing effort by running Dead on Zero!! Our Champion once again chopped the tree down in the semi-finals but got tripped up and would be forced to call it a day when he didn't quite cover on the top end sending Shawn Matis to the finals to face Billy Kennelley. 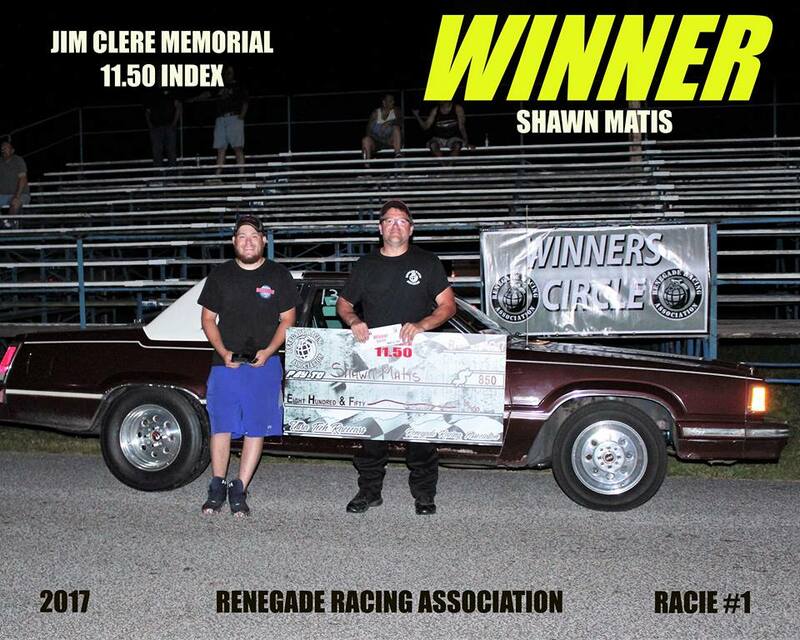 Billy would be caught napping at the starting line and Shawn would use that to his advantage taking the 1st win of the season for the Jim Clere Memorial 11.50 Index Class.